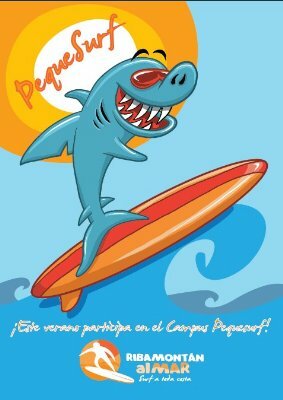 PEQUESURF, A ONE WEEK SURF CAMP FOR CHILDREN IN SOMO, CANTABRIA, SPAIN. The “Pequesurf” is primarily an introduction to surfing but also includes beach volleyball, beach football, fun rides, and art and environmental workshops. PEQUESURF is primarily an introduction to surfing but also includes beach volleyball, beach football, fun rides, and art and environmental workshops. The surf camp is located next to the beach on the main parking lot in Somo, Spain. A big marquee is erected in the area ,with easy access to the beach, along with a fun ride and all within a sealed off perimeter to ensure the children’s safety. The surf lessons will be taught on Somo beach and all other activities will either take place on the beach or under the marquee. Lunch and snacks will be provided at no extra cost. Activities include, beginners surf course, beach volleyball,beach football, a fun ride, an art workshop and an environmental workshop. The Pequesurf can be defined as an activity that provides both an educational and a sporting experience to the youth whilst promoting surfing as a medium to impress human and environmental values. The workshops are necessary and complimentary to the surf lessons, here the children will be able to make friends, have fun, work together and share chores, games and toys whilst still learning about the environment and the ocean. The “Pequesurf”, was created to provide a much needed educational and sporting service to our youth. A service which had been voiced by many parents as being a necessity. Large marquee for workshops and meals. The lessons will be organised by the local council and coached by experienced surf coaches, supplied by accredited Ribamontán Surf Schools, who are licensed both as surf instructors and life guards. Surfing is a growing sport with an estimated 10 million surfers currently scattered throughout the globe, many of them, in search of waves. Every year that number grows by a million and a half. Its no wonder therefore that surf travel generates approximately 10 million Euros a year. Last year, 5000 learner surfers came through the various surf schools in Ribamontán al Mar. As part of the council of Ribamontán al Mar, the villages of Loredo and Somo are amongst the most popular surf destinations in Spain. Ribamontáns surf initiative is supported by the Ministries of Industry, Tourism and Commerce of the Spanish Government, and the departments of Culture, Tourism and Sport of the Cantabrian Government and the local council of Ribamontán al Mar.